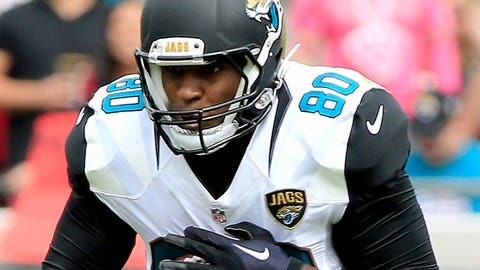 Julius Thomas says the Jacksonville offense has proven it can move the ball. Jacksonville Jaguars tight end Julius Thomas, who scored his first touchdown with the team in Sunday’s 31-20 loss to the Houston Texans, said there is plenty of reason for optimism despite a 1-5 start. Thomas said the Jacksonville offense, led by quarterback Blake Bortles, has demonstrated it can be effective under offensive coordinator Greg Olsen. The Jaguars are 12th in the NFL in passing yards, with second-year wide receivers Allen Robinson and Allen Hurns both continuing to make strides. Robinson has 28 receptions for 488 yards and five touchdowns, while Hurns has caught 29 passes for 460 yards and four touchdowns.